Honor 6 Plus review | What Hi-Fi? If you want a lot of tech for not a huge amount of money, this is it. 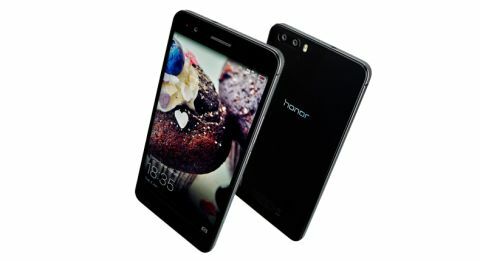 Honor – basically Huawei operating under a more Eurocentric label – seems to have designed a smartphone based entirely on a checklist. With a big screen, capacious battery, fancy camera and powerful processor, the Honor 6+ should be right at the top of the pile. But chasing specs is a dangerous game, and this is a good example of how even plenty of ticked boxes don’t always amount to a great product. They say imitation is the most sincere form of flattery. In that case, Apple should be blushing severely right now, because the Honor 6+ is clearly a big fan. The design looks essentially like a larger version of the iPhone 4. Only it’s not as nice. Unlike its stablemate the Huawei P8, which could conceivably pass for an iPhone 5, the Honor 6+ feels a little tacky. The glass-like back and metal-like bumper are both just plastic. Even the software is Apple-centric. The Honor 6+ actually runs on last year’s Android interface (version 4.4 KitKat), but it’s almost entirely painted over to resemble iOS. Apps appear in pages static grids, because the Android app drawer is nowhere to be seen. At least one core Android feature remains though: expandable memory. The Honor 6+ has two SIM trays, but one of them doubles as a microSD slot, compatible with cards up to 128GB. Video quality is impressive, and the Full HD screen is sharp and colours are vivid. The contrast levels are good for an LCD screen and we appreciate the little things, like being able to tweak the white balance. When it comes to sound, we’re disappointed. We were half expecting the Huawei P8’s standard – competent but in need of subtlety. But the Honor is one step down, overstepping the mark into brash territory. It’s not particularly engaging or well defined, and often sounds rough around the edges. The camera here is a curious beast. There are two 8-megapixel sensors at the back, which work together to give you 13MP photos. According to Honor, this mimics human sight and improves focusing. Incidentally, there’s a fancy mode that lets you tinker with a picture’s focus after you take the shot. The two lenses are also supposed to help with high dynamic range photos, which combine multiple photos of different light exposures. It all seems to work because the results are pretty good. Focusing is fast, which means it’s easy to get sharp shots, but it’s still some way behind the LG G4 on detail and dynamism. Battery life is good. The 3600mAh battery will easily see you through a couple of days. Loop a 720p video with half brightness and wi-fi connected, and it will last about 12 hours. The processor is a bit more erratic. With eight cores you’d expect the thing to zoom along, but it doesn’t. It’s fast enough most of the time, but we encountered the occasional stutter, and even with lighter tasks (checking emails, browsing photos) we felt the device heat up quite quickly. Specs and features aren’t everything. Just look at the Apple iPhone 6: its paltry specifications belie a top-class performance. Clearly the folks at Cupertino know how to maximise resources. Sadly it’s not the same story with Honor/Huawei. Despite ticking quite a few boxes, the Honor 6+ doesn’t blow us away. By all means, you should check it out for its laundry list of features – but not for audiovisual talent.